Introducing the 2019 next generation Ford Focus. This all-new model will feature the latest advanced and affordable technology, a more spacious interior and offer a more rewarding driving experience. The new Ford Focus is a culmination of research conducted globally by Ford designers. 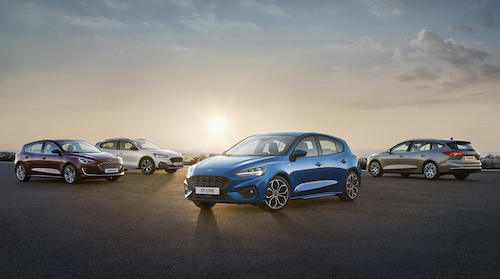 After speaking with Focus customers around the world, Ford has designed the best yet new Focus model with more human centered technology, comfort and versatility. It will be offered with multiple body styles, new trim levels and engine choices. New innovative technologies found on the upcoming Ford Focus include high-speed internet connectivity and the all-new Ford CoPilot360™ suite of advanced driver assist features. Designed to keep customers connected and safe behind the wheel, a variety of new high-tech safety features will be available. These include, Adaptive Cruise Control, Speed Sign Recognition, Lane Centering, Evasive Steering Assist, Active Park Assist and Ford’s Adaptive Front Lighting System. With a focus (pun intended) on improved cabin comfort, the interior space of the new Ford Focus has increased shoulder-room, knee clearance and legroom, courtesy of an extended wheelbase and flat floor. The interior materials are more upscale and refined while the instrument panel includes more touchscreen controls to reduce the number of dials and knobs across the dash for a cleaner, more organized command center. The new Ford Focus will continue to deliver class-leading driving dynamics but this model has an all-new chassis, refined suspension and a 20 percent improvement in torsional rigidity for better body control. Its new Electric Power Assisted Steering delivers a more responsive, engaging and intuitive steering experience affording drivers complete control. New Focus drivers will also have a choice of Normal, Sport or Eco drive modes enabling them to adjust engine and transmission response. Engine choices for this model vary by geographic region but include a range of advanced gasoline engines, such as the 1.0-liter EcoBoost engine and an all-new 1.5-liter EcoBoost engine optimized for high torque at low rpm. New Focus models equipped with Ford’s quick-shifting 8-speed automatic transmission will deliver improved fuel-efficiency and more responsive performance. Our Ford Dealership near San Francisco is anxiously anticipating the arrival of the all-new, next-gen Focus. It will be sold in Europe and China before it arrives in the U.S. If you would like to learn more about this exciting new model please contact us.